Congratulations to all, and as always our thanks to Jon, Monica and the rest of the Pro Shop staff for all their support in making our guest days enjoyable and successful. This happened recently in team play, do you know the answers? In stroke play, a player’s partner uses the flagstick to point out the line of putt. Which of the following statements are correct? a) There is no penalty whether or not the flagstick touches the green on the estimated line of putt. b) There is no penalty if the flagstick does not touch the green on the estimated line of putt. d) The player incurs a two stroke penalty if the flagstick touches the green on the estimated line of putt. 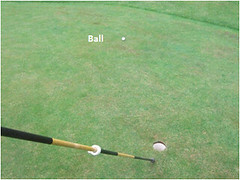 When the player’s ball is on the putting green, the player, his partner or either of their caddies may, before but not during the stroke, point out a line for putting, but in so doing the putting green must not be touched. 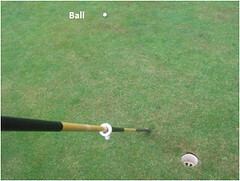 A mark must not be placed anywhere to indicate a line for putting. Penalty for Breach of Rule: Match play – Loss of hole; Stroke play – Two strokes. In stroke play in pointing out the line of putt a player’s partner touches the putting green behind the hole with the flagstick. Does the player incur any penalty? Even though the line of putt does not extend beyond the hole Rule 8-2b prohibits the putting green being touched to point out a line of putt when the player’s ball lies on the putting green. There is no penalty if the player’s ball lies off the putting green. Hope you got them correct and this helps you. Congratulations and thanks to you all for your participation. Here are the results to today’s game. We played Stableford today as we had 27 ladies. Frances Shipilov Hole #8 $25.00!! Nice round Shelly with a low gross score of 85! Congratulations to all the winners and thank you all for your participation. Overall Low Gross Winner: Lin Lenson with a score of 82. Great job ladies and congratulations!